You Think AdRev Stealing Your YouTube Monetization Money? Are You Counting On YouTube Monetization Money? Don’t Make This Common Mistake That Can Make Your Earnings Go To Someone Else! Do you want to cash in on YouTube monetized videos? Many YouTubers strive to produce a viral video that could potentially generate considerable advertisement money. However, you must make sure that nothings could jeopardize your earnings if your video indeed goes viral. Using background music that was not properly cleared for YouTube commercial use is one of those things that could ultimately block your YouTube monetization revenue. In this post I will briefly talk about YouTube Content ID system, AdRev copyright claims and what it means for your videos, and how you can remove the claims and get your YouTube monetization working again. Somebody is claiming that you are using their copyrighted material (that is, the background music) in your video. If you are not monetizing or don’t care about the ads appearing in your video, you can ignore this notice. Your video is still available on YouTube and your channel is not being penalized. However, if you do monetize your videos, that means that you will not see any monetization money until the claim in removed! Similarly, if you strongly oppose the ads appearing alongside your videos, the claim needs to be removed to make the ads disappear. YouTube employs the elaborate digital fingerprinting systems, called Content ID, aimed to prevent unauthorized use of copyrighted material. Every time you upload a new video to You Tube, the Content ID system scans your file matching it against their database of copyrighted video and music. When there is a positive match, you get the copyright claim. Who the heck is AdRev for Rights Holder? Many YouTubers complain that their videos get multiple claims from a company named AdRev that usually appears on the claims as “AdRev for Rights Holder” or sometimes “AdRev for a Third Party”. AdRev is a California based company that enables record labels, music publishers, and indie musicians to monitor how their music is being used on YouTube and to monetize on unlicensed usage. AdRev does NOT own copyright to the music they claim, they simply administer the rights on behalf of the owners. As you can see, AdRev isn’t a scam, as many disgruntled YouTubers claim, however there are certainly unscrupulous people who attempt to game the system by trying to monetize on the music they do not own in the first place. In fact, AdRev was recently named #2 fastest growing media company in America by Inc. 500. In a nutshell, AdRev is just another option for the copyright owners to monetize on YouTube, in particular by monetizing on videos using unlicensed background music. It works like this. The copyright owners, upload their music to the AdRev database and AdRev’s technology runs it through YouTube’s content id system and issues copyright claims to any video where it finds the match. If you can demonstrate that you have the proper license to use the music, the claim will be removed, otherwise you will have to accept the ads appearing on your video, so the music owner can monetize on unlicensed use. Of course, you can always delete the video as well. If you use unlicensed music or music that was not properly cleared for commercial use on YouTube, there is considerable chance that your advertisement revenues will go to someone else. But I paid for the license to use this music track on YouTube, why am I still getting the claims? The Content ID system does not know whether you have the license or not, it merely informs you that you are using copyrighted material. Now, if you do have the license, you can have the claim easily removed by contacting either the copyright owner (supposedly the one you obtained the license from) or AdRev’s support. Unlimited access from $99 a year. No contract, cancel any time. a) The music comes with a clear licensing agreement that explicitly includes the right to use the music in monetized commercial YouTube videos. b) Get the license directly from the copyright owner and do your due diligence to make sure this is indeed the owner and not just somebody who happened to upload the music illegally. If you choose to license the music from a music library, make sure that the library either controls the rights the their music (and can remove the claim if it comes to that) or provides you with the contact information of the copyright owner. Are you looking for YouTube safe background music? In my online royalty free music catalog you can find music in various genres that has been explicitly cleared for YouTube monetization. I am the sole copyright owner and I clear YouTube copyright claims within 24h. Check out Safe Music List – a bigger and more diverse royalty free music library for marketing and promotional videos. Many of their music tracks are not registered with AdRev. 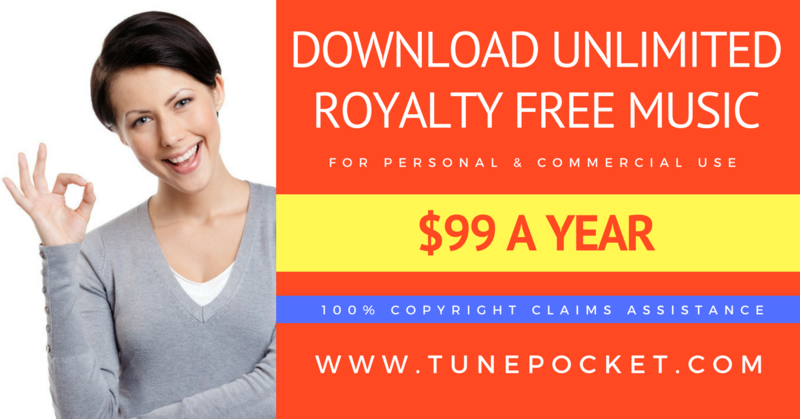 FAQ: I’m using royalty free / copyright free / public domain music, why am I getting the claims? Many YouTube producers complain about getting copyright claims for using royalty free / “copyright free” / public domain music. First of all, royalty free does not mean copyright free, it literally means no performance royalties and in no way means you can use it for free and with no permission. In fact, many royalty free composers rely on AdRev to monitor where their music appears on YouTube. If you have the proper license, simply contact the owner and ask to remove the claim. It could be you getting your the music from the wrong place. Internet is filed with “free” music. Sadly, lots of it ended up “free” with no consent from the copyright owners. Did you receive a copyright claim for using my music? First of all, thank you for choosing my music. I do appreciate this! If you received a copyright claim for using my music, don’t panic, I am the sole copyright owner to all my music and I can quickly remove the claim. Do not dispute the claim with YouTube! It will take a considerable time and I can remove it much quicker, normally on the same day I receive your message. Simply send me the link to your YouTube video along with the order number (you can find it in the confirmation email that you received when you purchased the license). If you can’t find the order number, I should be able to look up your order by your name or email. To prevent the claims, send me the link, as soon as your video is published on YouTube. You can even send it to me before it’s published, since YouTube allows for uploading without immediate publishing. The copyright claims are issued when YouTube’s content ID system detects copyrighted music in uploaded videos. This happens because the copyright owners authorized YouTube and AdRev to monitor their music usage and to monetize by displaying ads in videos that use unlicensed music. If you are monetizing your videos, you won’t get any advertisement revenue until the claim is removed. The fastest way to remove the claim is to contact the copyright owner who granted you the license. When licensing music for commercial YouTube use, make sure you are getting the license directly from the owner and that the license explicitly covers YouTube monetization. Take a look at my online royalty free music catalog for some examples of YouTube safe background music. Have a question about AdRev copyright claims? Write a comment or post your question on my Google, Twitter, or Facebook pages or in this Google+ community: Music Licensing Questions. If you find this post helpful, share it or comment! What pisses me off is they don’t SHARE. mount Everest and fly to and land at the most dangerous airport in the world, Lukla. The adventure starts with a guided tour around the top (Santana’s, Dawn Go Within), then it turns even more dangerous as he starts to run out of air early. On the rush down, he passes out into a dream state (Looking for space by John Denver) where he is abducted by an alien flying saucer. The adventure continues as he descends quickly to (Ride like the wind, Christopher Cross) to Breathe. (Pink Floyd, Breathing the Air) as he continues down 10,000 feet. The missions continues as he does aerobatic flying to Kenny Loggins Danger Zone from Top Gun. The mission ends with a breathtaking approach and landing to Lukla, with Santana’s Europa. No way I can get the permission of all these different artists. If i upload it, no way will it receive a dime, and they will own it. I wouldn’t mind the ads at the beginning, but to not give me anything is greedy. The billions they have aren’t enough? They have to stiff the video creator too. Anyway, how do I make some money off this incredible adventure movie? I’m thinking of putting up a trailer on you tube that I don’t care about monetizing, that will point to a pay per view private web page or something. There are many alternatives to using music by renowned recording artists. You just need to look around. Starting from legit free / creative commons music to affordable royalty free music, there are quite a few options. If you have budget, you can also commission custom music or even ‘sound-alikes’ and own 100% rights to the soundtrack. Hi, can you please tell me how to partner with adrev to save my content get copyright claims from elsewhere? thanks. I signed up for adrev 2 month ago. As I know it takes up to 3 month util I can see my earnings. Iam exited to see my first results! So I have a copyright claim form AdRev. My argument is they did not state who their third party is. If they represent a third party, they should at least state who that 3rd party is so we can know and do further inquiries. Unfortunately is says the content belongs to RFAT and I have looked for this artist/group and found no results. I used this ‘common’ epic song in my vlog. In summary, if they are representing a third party, shouldn’t thet state who it is instead of the claimant be ‘AdRev for a third party’. Without knowledge of this third party can’t it be a scam. I will say I don’t get many views from my vlogs so I’m not losing revenue but as a matter of principle, I want to know if I can argue my point by filing a dispute. Hi, it’s always best to secure permission or a license from the music owner BEFORE using it in the video. Alternatively, use free music from a reputable source (like YouTube’s own music library, for instance). When you use a ‘common epic song’ just because everyone else seems to use it, you expose yourself to all sorts of liability. Nonetheless, if you have a reasonable explanation to present to AdRev, you certainly can dispute the claim. In my experience, they will gladly retract the claim, as long as you can demonstrate that you either use a legit free track or have a license / permission from the owner. Hope that helps. These “publishing” companies are set up to illegally steal money, that’s it. It’s the same with The Orchard Music, Merlin Group, etc. They require no proof from the artists that sign up to their website, anyone can download someone’s music, push it through AdRev, and then AdRev monetizes every video on YouTube that uses the music. I’m currently dealing with a claim right now. I disputed it, gave them the information that it was my music, 100% of the copyright is owned by me… they rejected my dispute. I e-mailed them and sent them a link to the COPYRIGHT OFFICE WEBSITE showing them my copyright entry under my legal name and they sent me back a pre-written reply about me having to provide a license because they “have to protect our clients”. How exactly do I provide a license to myself for my own music? AdRev is a scam. If they don’t want to be called a scam then they need to tighten up their customer support and force users to provide proof that they own the music they’re submitting to the content ID service. Absolutely agree. I have just gone through exactly the same thing with music I had bought the licence to (hopefully my post will appear soon). If AdRev is not to be seen as a scam it will have to do more to prevent bogus ownership of works. I suspect the practice is rife and if the truth were told, possibly a right money making racket. I don’t blame music publishers using organisations to track usage. OK, so they are not scams. But surely the practice I have just come across deserves that description. I received a warning from YT saying music I used was copyright. Correct, it was. And what’s more I had a licence to use it. However, the so-called copyright owner was NOT the same person as the one I bought my licence from. To rub salt into the wound YT then continued to refer to the claimant as “the copyright holder”. I made a counterclaim against YT but also contacted the rightful owner of the music. Thankfully they are a well know company with friendly people who answer the phone immediately. Within minutes they had the problem sorted. But oh, AdRev what kind of an outfit are you when you simply accept someone’s word that they are they are the publishers of a work and then lay claim to it on behalf of those so-called publishers?